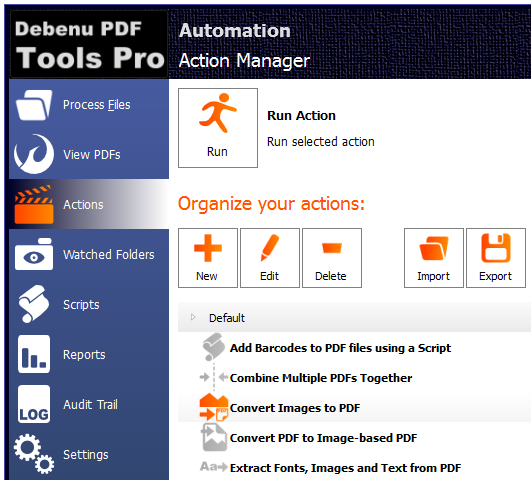 Debenu PDF Tools lets you automate your PDF workflows so that they are optimized for speed and accuracy. Remove repetitive and time wasting steps from your daily work, create pre-defined Actions and then Debenu PDF Tools do the rest. Need some examples of what Debenu PDF Tools can do to automate your PDF workflows? That’s just a short list of all the tasks that Debenu PDF Tools can help you with. PDF automation has never been this easy. Debenu PDF Tools includes a variety of different Tools such as Edit Document Metadata, Image to PDF, PDF to Text, PDF Stamp, Delete Pages and many more which can be combined together to create Actions. Actions can be used by themselves in a batch process with one or thousands of PDF files and they can also be used with Watched Folders to completely automate your workflows. 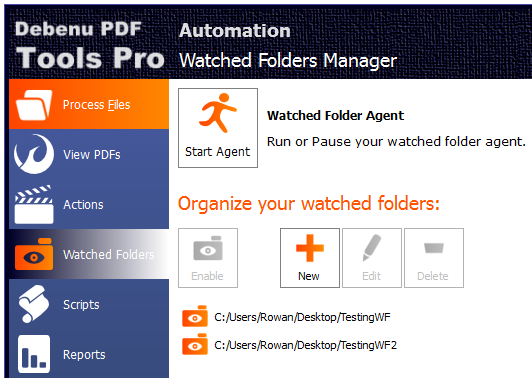 Once you have created your Actions you may want to take your PDF automation to the next level with Watched Folders. Simply select a folder, assign an Action to it and sit back and watch as any file that is copied into that folder is automatically processed and placed in the output folder. You can create as many Watched Folders as you like and you can even watch a folder in Dropbox! Download the 14 day fully functional trial version of Debenu PDF Tools.